We deal in Ceramic Sleeves. With honest intentions to improve the standing we have earned in this arena, we are offering a distinct collection of Ceramic Sleeve. We manufacture and supply ceramic (f.g. reinforcement) sleeves for heat pipe insulation. Size 25mm, 50mm, 65mm etc. Delivery - 1 - 2 weeks. Temperature resistance 900 - 1200 deg. c.
We manufacture and supply a wide range of Ceramic Protective Sleeves and are highly acknowledged for flexibility, impact resistant and color coding. We utilize quality material to manufacture them, which make them highly durable and convenient to use. Yogdeep offer high alumina ceramics, zirconia and mullite. We offer high alumina ceramics in all shapes and sizes required by mechanical seal manufacturer. 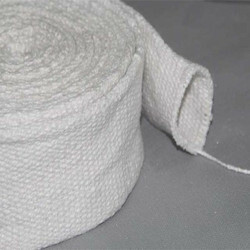 Wire & cable industry textile industry electronic industry advantages of our ceramics: significantly longer life excellent wear resistance high surface finish cost effective quick delivery. We are the manufacturer of high alumina ceramic sleeve suitable for mechanical seals used in chemical pumps, We developed ceramic sleeve for most of the pumps like Antico pump, Rajedia Pump, A k pump, Resicat pump, also our ceramic sleeve can be used in highly concentric acids. We have most sizes developed as is shown in the chart.